I'm sure some of you think I'm totally crazy for putting together a Halloween basket for Ellie, but that's just how I roll. It's really just meant to be a way to incorporate some fun things + activities during the month of October... a little bit of extra festiveness, if you will! Today I'm sharing what went in Ellie's boo basket this year, as well as some of my favorite festive finds for boys + girls! H&M is a close second on my list of favorite places to shop for Ellie. 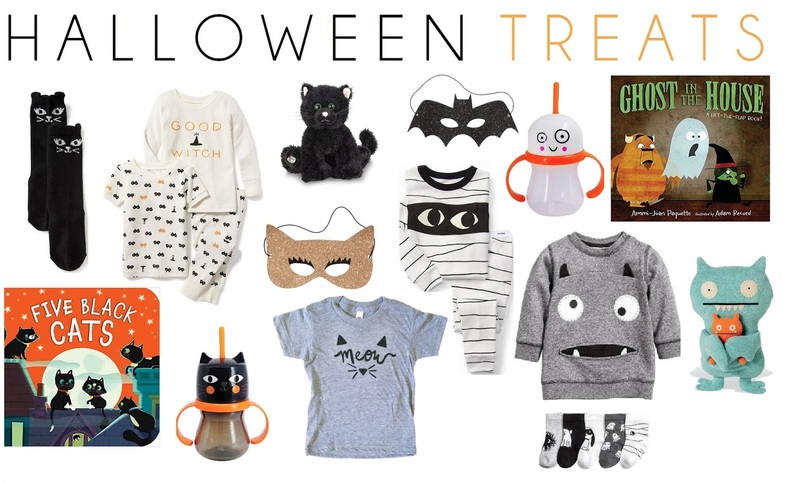 They have so many cute Halloween things this year for babies + toddlers (clothes, accessories, party supplies, etc. ), so definitely check it out if you haven't already!! Ellie's age can still be a toss up when it comes to things like this. I already have a couple ideas for next year when she's a little bigger and can be trusted to do more things... like paint pumpkins without eating all the paint. ;) Here's what went in her basket this year - everything except the book that I ordered off Amazon came from Target (mostly dollar spot finds!). A cute Halloween tee, a seasonal sippy cup that will inevitably leak everywhere (we picked the monster for a reason, FYI! ), a book, stickers, the sweetest bandaids ever for the girl who is constantly getting boo-boos, candy and a pumpkin stencil kit that Ellie will "help" me with. Her reaction? She went straight for the sippy cup and brought it over to the fridge to have it filled up with water, and then she realized there were Peeps in the basket and that was the end of that. Girlfriend loves marshmallow anything so I knew those would be a hit! Adding a new festive book to Ellie's collection is going to be a staple each year. Ellie's most favorite Halloween book is definitely Little Blue Truck's Halloween. She loves the illustrations and lifting all the flaps, but finding the black cat on each page is probably her favorite part about it! We also love the movie Room on the Broom - we have the book but the movie keeps Ellie's attention so much better at the point. The animation and the music are really awesome, and as shocking as it sounds, Ellie loves the cat! ;) Such a cute movie that we both enjoy watching. It's super cheap to buy and worth the whopping $4 investment, but you can also find it on Netflix or watch for free if you have an Amazon Prime membership!